Welcome to Sure To Surprise You! Cumbria Crockery Hire is our speciality! Whether it is vintage crockery or traditional white crockery hire we can deliver it straigh to your door throughout Cumbria but we also travel to Yorkshire and the surrounding areas providing the finishing touches to any foodie occasion. Pile our cake stands high with savoury treats for your buffet table, sip champagne in style from our champagne saucers or enjoy a nice cup of tea whilst chatting with friends at your afternoon tea party - whatever the occasion our crockery and glassware will add to it. We can deliver to your door anywhere in Cumbria and the surrounding counties for you to enjoy. By the way, we can also set it up for you! Why buy when you can hire? We want to make your life easier and hire items to you rather than you having to buy them. Not only do we save you time and money but we promise that all of our items are to the upmost standard and we can even source items for you that you want for your wedding, birthday or celebration gathering. Our aim is to play a part in making your celebrations just that little bit extra-special and easier for you. Our stock has risen to 500 people in white crockery and 200 in vintage and we have helped 100's of Brides and Grooms along with Venues, Suppliers and Clients. It has indeed been a crazy 5 years! As we enter our 6th year in April we have decided to offer a couple of discounts! 10% discount on all hiring items and Crockery hired alongside any of our Wedding Planning options...! 6% discount on all orders over £100 - every little helps?! 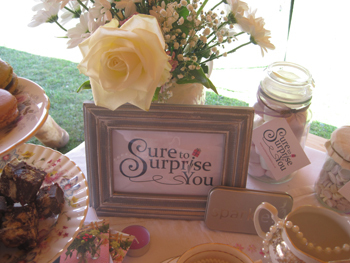 Have a look at our hiring page for prices or email us info@suretosurpriseyou.co.uk to see if your date is free?